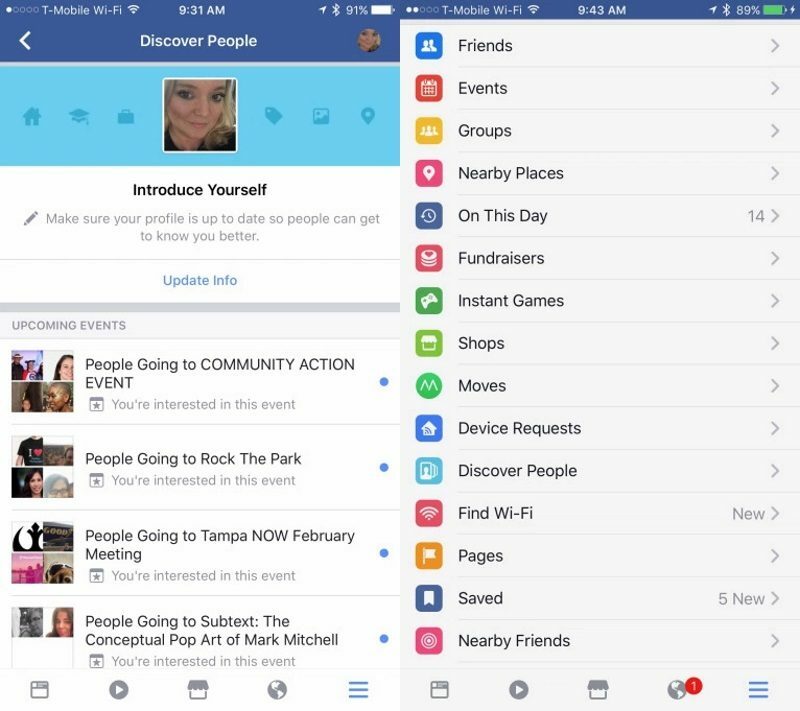 Facebook is rolling out a new section to its mobile app called "Discover People", which is designed to encourage connections between people who aren't yet Facebook friends (via TechCrunch). The new feature, which can be found at the bottom of the navigation section of the app, allows users to scroll through a list of upcoming events to see who else is going, as well as browse through lists of people in the local area or those who share the same employer. Entering "Discover People" for the first time, users are asked to introduce themselves by updating the various sections of their public profile. Once the profile is set, a list of upcoming events appear below, featuring any events the user plans to attend, has registered an interest in, or has been invited to. Users can also check out the profiles of others similarly linked to the event. True to the feature's billing, profiles of people already befriended on Facebook don't show up in the lists, only people who don't know each other – though whether this "discovery" mechanism will sit comfortably with all users is unclear. For example, not everyone automatically wants to make their interest in an event public knowledge, and currently there's no way to control privacy settings when a user registers such interest. Facebook has tested similar features in the past, only to roll them back following users' privacy concerns – "Friends Nearby" being one example. TechCrunch suggests that with the latest attempt to connect people, Facebook is pushing back against dating apps like Tinder and Bumble, two apps that recently expanded their dating remit to include finding new friends to hang out with. "Discover People" was first launched late last year, but was initially restricted to New Zealand and Australia. Facebook says the feature is rolling out now and should appear for all iOS users in the coming days. Somehow my FB app ballooned to around 750mb. I deleted/reinstalled, and it went back up to 750mb in about a day. Deleted it completely and will not reinstall on my phone.